Thierry Caens was born in Dijon (France) in 1958. 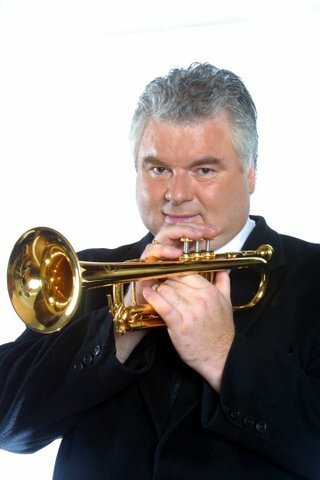 He received his first musical education with his father and then with Robert Pichaureau and Pierre Pollin, and joined the Paris Conservatoire National Supérieur de Musique in the class of Maurice André, where he obtained a First Prize for Trumpet in 1977 and a First Prize for Cornet in 1978. He joined the Orchestre de Lyon as Solo Trumpet at age 17. From 1981 he was Solo Cornet with the Orchestre de l’Opéra de Paris for five years. In the meantime he won a Bronze Medal at the Geneva International Competition in 1981 and founded the “Concert Arban” which he led until 1989, when he became musical director of “Les Cuivres Français”. He plays in trio regularly with horn-player André Cazalet and trombonist Michel Becquet. He currently teaches at the Dijon Conservatoire and has been a trumpet-teacher at the Lyon Conservatoire National Supérieur de Musique since 2003. He now devotes himself mainly to his career as a soloist, and is invited in the most famous concert halls in the world, from the Geneva Victoria Hall to Bunka Kaikan in Tokyo, including China, Italy and the United States, not forgetting the Paris Salle Pleyel. And numerous orchestras : The Moscow Chamber Orchestra, the Israel Camerata, the Tokyo Metropolitan Orchestra, the Sapporo Symphony, the Bremen Symphony, the Budapest Franz Liszt Orchestra, l’Ensemble Orchestral de Paris, l’Orchestre d’Ile de France, l’Ensemble, l’Orchestre Bernard Thomas, l’Orchestre Lamoureux, l’Orchestre de Chambre National de Toulouse, l’Orchestre Colonne, le Capitole de Toulouse (conductor Michel Plasson), l’Orchestre National de Lyon, Granada Orchestra, l’Orchestre Poitou-Charentes. Everywhere he is acclaimed as one of today’s best trumpet-players. – World Music: Henri Agnel, René Aubry, Gustavo Beytelmann, Juan Jose Mosalini. He plays in duet with Manuel Rocheman, piano, and in trio with Leonardo Sanchez, guitar, and Patrice Caratini, double-bass. – He played the trumpet solo part of Jean-Claude Petit’s score for the film Cyrano de Bergerac. – Since October 1977 he has been sound-designer for the German firm J. A. Musik and contributes to the design of B&S trumpets. – A composer and arranger, he runs the Hamelle-Leduc “Thierry Caens” collection, and Midi-Musique’s Brass-Plus collection on the Internet. – He was Artistic Director of the Camerata de Bourgogne (1987 – 2009) and he is always of the festival “Musique au Chambertin”. – He gave a world première of William Sheller’s Concerto at the Paris Salle Pleyel in January 1993 with the Orchestre des Concerts Lamoureux conducted by Yutaka Sado. – In 1999 he created his first show Le Piston Magique at the Music Festival of Sully-sur-Loire with the circus company “Les Saltimbanques”, stage-produced by Jean-Marie Sénia. – In 2002 he premièred Trois Danses, 1st Concerto for Trumpet, Accordion and Orchestra, by and with Richard Galliano. In 2003, Bleu comme une Orange, by Patrice Caratini for Trumpet and Jazz Orchestra. In 2004, Double Concerto, by and with Martial Solal, with l’Orchestre Poitou-Charentes. – In February 2005, at the Paris Théâtre des Champs-Elysées, he premièred the Concerto de Cyrano, composed by Jean-Claude Petit from his own film-score. – In April 2006, Thierry Caens published Troisième Souffle, a CD recorded in 2004 with the Orchestre National de Lyon (conductor Michel Plasson), consisting of works dedicated to him by Michel Colombier, Richard Galliano and William Sheller.